Yet the story of its beginning is a mercenary tale: Martin knew he wanted to write an epic fantasy, inspired by Tolkien in particular. Yet he had no concept of what he wanted to write. Finally the idea of a set of siblings adopting direwolf pups came to mind, and he was off and running. Still, he sold the story to a publisher with only a quarter of it written. ... much like a soap opera. Yes, this was my first impression and it persisted to the end. Game of Thrones is not so much a fantasy as it is an elaborate soap opera in a classic medieval setting. And soap operas aren't my cup-o-tea. When I read a fantasy novel I'm looking for innovative and imaginative settings. What Martin gives me are text-book medieval settings. I want plots involving unusual creatures and metaphysical elements that have not been previously explored – things to send my imagination soaring in new directions. The characters in the story ought to find a significant part of their conflict coming through entanglement with these imaginative new elements - moreso than through getting in each others' faces. Martin seems to prefer the character interplay. He barely dabbles in anything metaphysical and only trots out a few zombies and baby dragons at the very fringes of the story. The rest of it is just historical-style fiction meticulously well researched and well written, but not what I’m after. 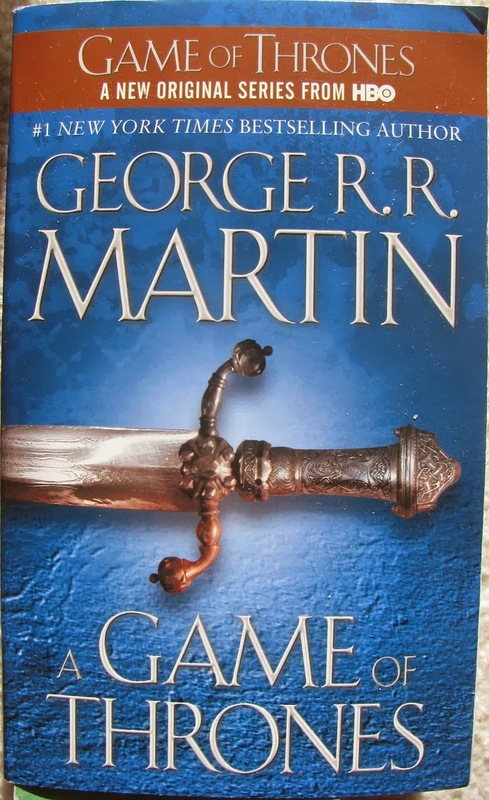 The story is written through the limited point of view of eight of the principal characters, all but two of which are members of the immediate family of Ned Stark. Ned is lord of Winterfell - a northern stronghold in an island nation modeled after Great Britain (geographically as well as ethnically). To his north is an ancient wall that is the frontier of civilization, modeled after China's Great Wall. To his south is Ned's good friend the King and an array of ambitious noble families with conflicting interests, full of grudges and entanglements with one another. The plot begins to thicken when the King's Hand (his chief executive) is murdered and Ned is called south to take his place. And the plot just continues to thicken. As events unfold we are shown great castles of many descriptions, all beautifully realized, we experience jousts and sword-play, betrayals and executions, squalid brothels and grand state dinners, and ultimately war. And everywhere there is blood. Martin seems to find an interesting or unexpected way to make someone bleed profusely in every chapter. Did I mention that he was a Hollywood screen writer before he wrote Game of Thrones? Okay, all in all a rousing good time if you like that sort of thing. 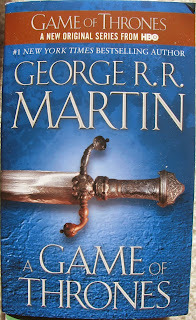 I'm sure I'll be reading on through the rest of the 'Song of Ice and Fire' saga. I'm told there will be seven books in all, possibly even eight, two (or three) not yet finished as of the end of 2013. Martin is sixty-five, barely a month older than I am, and he's been writing one new book in the series about every five years. Let's hope his health and his enthusiasm hold.